The Genetic Information and Privacy is an equal opportunity law poster by the Louisiana Office Of Human Resources. This is a mandatory posting for all employers in Louisiana, and businesses who fail to comply may be subject to fines or sanctions. This poster must be posted in a conspicuous place where all employees will see it. This poster discusses the rights of employees with regards to their genetics. Employers cannot discriminate against employees because of their genetics. It appears you don't have a PDF plugin for this browser. 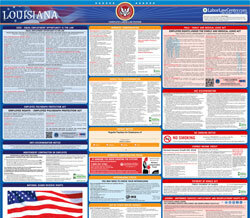 Please see the link below to download louisiana-genetic-discrimination-ltr-color.pdf. due to exposure to toxic substances in the workplace. purposes, or for genetic education or counseling. related genotypes or karyotypes for clinical purposes. medical communities to qualify under this de ﬁ nition. condition or disorder in fami ly members of the individual. on the basis of protected genetic information. toxic substance shall be permitted in the workplace.